These perfectly pretty French cakes are dainty and divine! The edges are sweet and crisp. The interior is buttery and meltingly decadent, with a tangy and juicy raspberry in the center to round out the flavor profile. 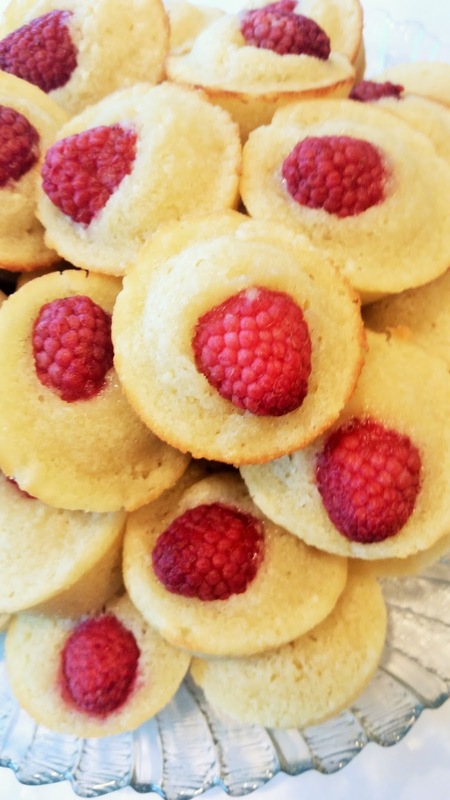 The batter is almond flour based so they are GLUTEN FREE. They take a bit of effort to make but when you pile a platter with a tower of these delicate little golden and ruby pillows you will feel it was all very much worth it. Preheat the oven to 400°F. Spray a 24 count mini muffin tin well with cooking spray. Melt the butter and set it aside to let it cool slightly. Grind the sugar in a food processor (I use my Magic Bullet because it is small and quick for the job). Pulse until you have a fine powder. This gives bettter flavor than ordinary powdered sugar. Combine the sugar and almond flour in a large bowl. In a searate bowl, whip the egg whites and salt until you have a frothy bowl of bubbles. It should be quite bubbly on the surface. It only takes about 30 seconds or so of vigourous whipping. Gently fold the egg whites into the dry ingredients. Then add in the egg yolk and vanilla. Add the melted butter and keep folding. Worry not! It will look very liquidy but keep gently turning the mixture until the butter is incorporated. Spoon the batter into the oiled muffin tin. 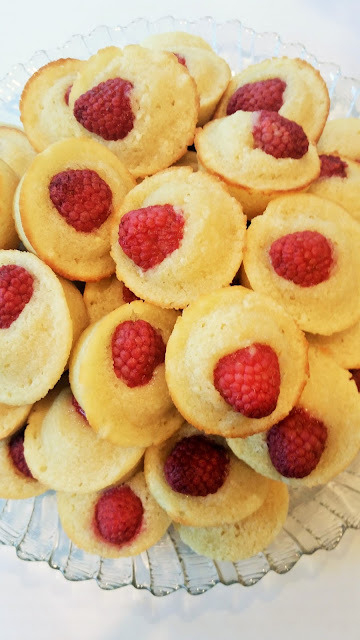 Softly place a raspberry with the hole side down on the center of each financier. Be careful not to press them in. They will sink while cooking. Bake for 9 minutes (11 if using a silicone mold) and place on a wire cooling rack. Allow them to cool for a good 15 min or so before trying to remove them from the molds.